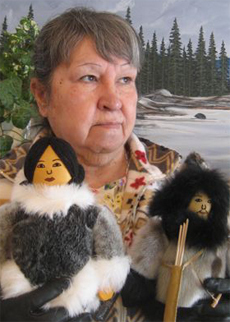 Born in Sango Bay in the 1940's, near the Innu community of Davis Inlet, Emily grew up in the Inuit community of Hopedale. Later, in her teens, Emily moved to Goose Bay to find work and found both work and marriage to a serviceman. 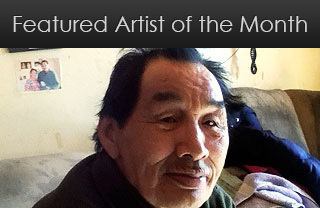 As a single Inuit elder, today she lives alone, supporting herself as a well-known dollmaker, artisan and crafter. 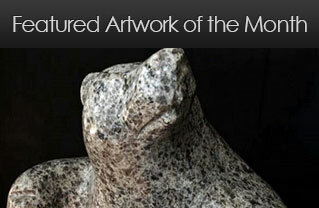 From sealskin mitts, moccasins to Inuit teadolls, Emily Flowers is making an art of her craft. 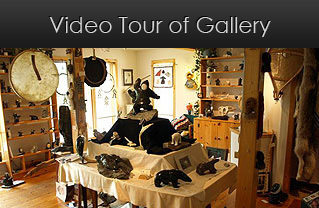 Paintings and caribou hair sculptures and tuftings are her most recent creations, but it is her distinctive Inuit teadolls, dressed in traditional sealskin and fabric teadolls that she is best known for.